“The man who shot the man who shot the man who shot Jesse James is most often how Joseph Grant Burnett is described in writing. 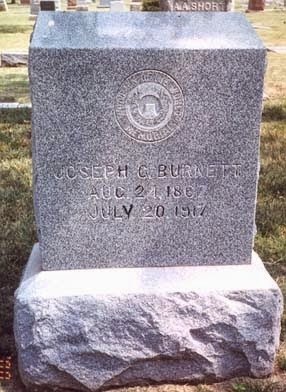 Known as Joe Burnett, he was an Oklahoma City police officer from 1901 until his death in 1917. He died as a result of a stroke and the day of his funeral, the Police Chief arranged for one-half of the police force to be granted leave to attend the funeral. Officer Burnett’s fame was ensured when, in January of 1904, while walking his beat in downtown Oklahoma City, he encountered Edward O’Kelley, who, in 1892, shot and killed a man named Bob Ford in a silver mining camp in Creede, Colorada. Bob Ford had shot Jesse James in the back of the head ten years earlier in order to collect a reward. According to accounts of Ford’s killing by O’Kelly, Ford was accorded the opportunity of facing his killer, when O’Kelley walked into his saloon and, seeing Ford turned away, said, “Hello, Bob.” As Ford turned to face him, O’Kelley fired his shotgun killing the man who killed Jesse James. It’s not known exactly why O’Kelley killed Ford, but it was clearly not because he believed in law and order. He was considered a dangerous killer and may have murdered Ford to enhance his reputation. After serving eight years in Colorado prisons for the murder, he was released and moved to Oklahoma City, where he would soon make the deadly mistake of challenging Officer Joe Burnett. Some accounts of their encounter detail a pleasant Officer Burnett speaking to O’Kelley, addressing him by his name as they passed on the street. But O’Kelley is reported to have responded by striking the officer and drawing a pistol. The two men struggled, with O’Kelley firing his pistol until it was empty, then biting chunks from both ears of Officer Burnett. During the struggle, Burnett cried out for help, identifying himself as a police officer. Several men refused to come to his aid. Finally, a railroad baggage man named A.G. Paul heard the commotion and ran from the depot. He grabbed the hand of O’Kelley, freeing Burnett to draw and shoot the outlaw twice, killing him. When it was over, both Burnett’s ears were mangled from having been bitten. One ear also had powder burns from the firing of O’Kelley’s pistol. In addition, Burnett’s overcoat had two bullet holes in it. Officer Joe Burnett barely escaped being another law enforcement statistic in the long list of line-of-duty deaths. 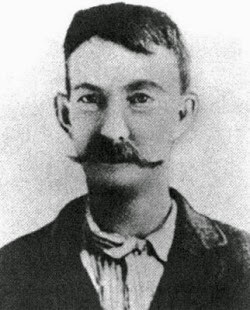 Joe Burnett stayed with the police department, eventually being promoted to Captain and serving for a time as Night Chief. His brother was also a police officer in Oklahoma City. When he died in 1917, he left a wife and three children.